Washington, DC, March 24, 2014 – Director of National Intelligence James Clapper has won the infamous Rosemary Award for worst open government performance in 2013, according to the citation published today by the National Security Archive at www.nsarchive.org. Despite heavy competition, Clapper's "No, sir" lie to Senator Ron Wyden's question: "Does the NSA collect any type of data at all on millions or hundreds of millions of Americans?" sealed his receipt of the dubious achievement award, which cites the vastly excessive secrecy of the entire U.S. surveillance establishment. Gen. Keith Alexander, director of the NSA, for multiple Rose Mary Woods-type stretches, such as (1) claiming that the secret bulk collection prevented 54 terrorist plots against the U.S. when the actual number, according to the congressionally-established Privacy and Civil Liberties Oversight Board (PCLOB) investigation (pp. 145-153), is zero; (2) his 2009 declaration to the wiretap court that multiple NSA violations of the court's orders arose from differences over "terminology," an explanation which the chief judge said "strains credulity;" and (3) public statements by the NSA about its programs that had to be taken down from its website for inaccuracies (see Documents 78, 85, 87 in The Snowden Affair), along with public statements by other top NSA officials now known to be untrue (see "Remarks of Rajesh De," NSA General Counsel, Document 53 in The Snowden Affair). The same National Security Division lawyers who swore under oath in the Electronic Frontier Foundation's Freedom of Information Act lawsuit for a key wiretap court opinion that the entire text of the opinion was appropriately classified Top Secret/Sensitive Compartmented Information (release of which would cause "exceptionally grave damage" to U.S. national security). Only after the Edward Snowden leaks and the embarrassed governmental declassification of the opinion did we find that one key part of the opinion's text simply reproduced the actual language of the 4th Amendment to the U.S. Constitution, and the only "grave damage" was to the government's false claims. President Obama for his repeated misrepresentations about the bulk collection program (calling the wiretap court "transparent" and saying "all of Congress" knew "exactly how this program works") while in effect acknowledging the public value of the Edward Snowden leaks by ordering the long-overdue declassification of key documents about the NSA's activities, and investigations both by a special panel and by the Privacy and Civil Liberties Oversight Board. The Emmy and George Polk Award-winning National Security Archive, based at the George Washington University, has carried out thirteen government-wide audits of FOIA performance, filed more than 50,000 Freedom of Information Act requests over the past 28 years, opened historic government secrets ranging from the CIA's "Family Jewels" to documents about the testing of stealth aircraft at Area 51, and won a series of historic lawsuits that saved hundreds of millions of White House e-mails from the Reagan through Obama presidencies, among many other achievements. 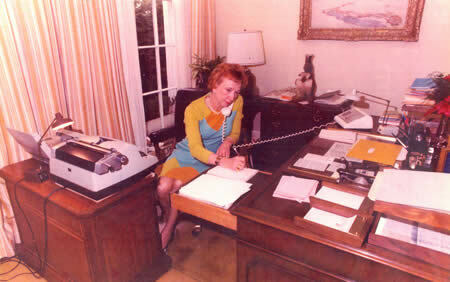 The Archive established the not-so-coveted Rosemary Award in 2005, named after President Nixon's secretary, Rose Mary Woods, who testified she had erased 18-and-a-half minutes of a crucial Watergate tape — stretching, as she showed photographers, to answer the phone with her foot still on the transcription pedal. Bestowed annually to highlight the lowlights of government secrecy, the Rosemary Award has recognized a rogue's gallery of open government scofflaws, including the CIA, the Treasury Department, the Air Force, the FBI, the Federal Chief Information Officers' Council, and the career Rosemary leader — the Justice Department — for the last two years. Rosemary-winner James Clapper has offered several explanations for his untruthful disavowal of the National Security Agency's phone metadata dragnet. After his lie was exposed by the Edward Snowden revelations, Clapper first complained to NBC's Andrea Mitchell that the question about the NSA's surveillance of Americans was unfair, a — in his words — "When are you going to stop beating your wife kind of question." So, he responded "in what I thought was the most truthful, or least untruthful, manner by saying 'no.'" 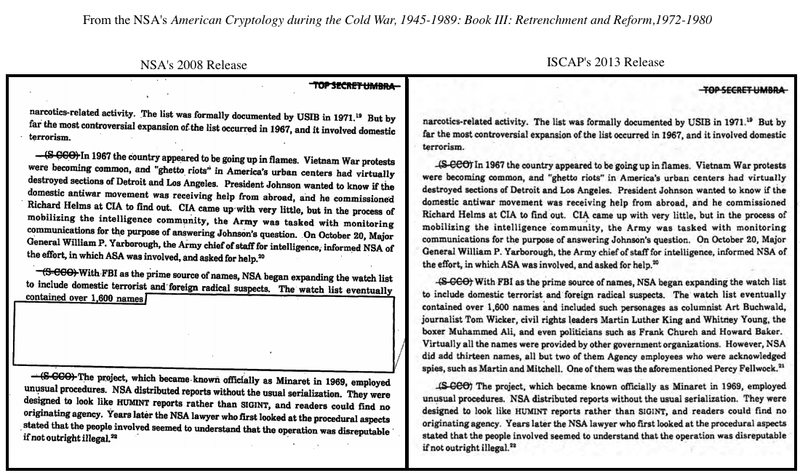 After continuing criticism for his lie, Clapper wrote a letter to Chairman of the Senate Select Committee on Intelligence Dianne Feinstein, now explaining that he misunderstood Wyden's question and thought it was about the PRISM program (under Section 702 of the Foreign Intelligence Surveillance Act) rather than the telephone metadata collection program (under Section 215 of the Patriot Act). Clapper wrote that his staff "acknowledged the error" to Senator Wyden soon after — yet he chose to reject Wyden's offer to amend his answer. Former NSA senior counsel Joel Brenner blamed Congress for even asking the question, claiming that Wyden "sandbagged" Clapper by the "vicious tactic" of asking "Does the NSA collect any type of data at all on millions or hundreds of millions of Americans?" Meanwhile, Steve Aftergood of the Federation of American Scientists countered that "it is of course wrong for officials to make false statements, as DNI Clapper did," and that in fact the Senate Intelligence Committee "became complicit in public deception" for failing to rebut or correct Clapper's statement, which they knew to be untruthful. Clapper described his unclassified testimony as a game of "stump the chump." But when it came to oversight of the National Security Agency, it appears that senators and representatives were the chumps being stumped. According to Representative Justin Amash (R-Mich), the House Intelligence Committee "decided it wasn't worthwhile to share this information" about telephone metadata surveillance with other members of Congress. Classified briefings open to the whole House were a "farce," Amash contended, often consisting of information found in newspapers and public statutes. Even an author of the Patriot Act, Rep. Jim Sensenbrenner (R-WI), was broadsided by the revelation of the telephone metadata dragnet. After learning of the extent of spying on Americans that his Act unleashed, he wrote that the National Security Agency "ignored restrictions painstakingly crafted by lawmakers and assumed plenary authority never imagined by Congress" by cloaking its actions behind the "thick cloud of secrecy" that even our elected representatives could not breech. 2006 - the Central Intelligence Agency (for the biggest one-year drop-off in responsiveness to FOIA requests yet recorded). Admiral William McRaven, head of the Special Operations Command for the raid that killed Osama Bin Laden, who purged his command's computers and file cabinets of all records on the raid, sent any remaining copies over to CIA where they would be effectively immune from the FOIA, and then masterminded a "no records" response to the Associated Press when the AP reporters filed FOIA requests for raid-related materials and photos. If not for a one-sentence mention in a leaked draft inspector general report — which the IG deleted for the final version — no one would have been the wiser about McRaven's shell game. Subsequently, a FOIA lawsuit by Judicial Watch uncovered the sole remaining e-mail from McRaven ordering the evidence destruction, in apparent violation of federal records laws, a felony for which the Admiral seems to have paid no price. The Department of Justice Office of Information Policy, which continues to misrepresent to Congress the government's FOIA performance, while enabling dramatic increases in the number of times government agencies invoke the purely discretionary "deliberative process" exemption. Five years after President Obama declared a "presumption of openness" for FOIA requests, Justice lawyers still cannot show a single case of FOIA litigation in which the purported new standards (including orders from their own boss, Attorney General Eric Holder) have caused the Department to change its position in favor of disclosure.